Please join us to raise our hearts and voices in the sacred practice of chanting! All proceeds go to those in need from the Camp Fire. Several of us in Radiant Friend know people personally who have lost everything, so we plan to give back. Donate big or small, all welcome. There are many places and ways to give, one we recommend is North Valley Community Foundation. We can also put you in touch with families directly. Sending our love to all! See you on December 1! Join Radiant Friend for call and response chanting, a practice that unites us with our highest, happiest selves. We will repeat mantras–words, phrases and syllables– to quiet our minds and allow the integration of the meaning of the mantras into our consciousness. Be soothed by these sacred sounds. $20 at the door (check or cash), no one turned away (pay what you need). 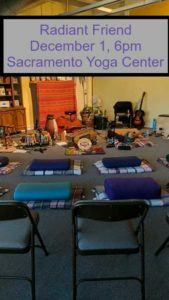 Sacramento Yoga Center, inside Sierra 2 Center at 2791 24th Street. No musical experience necessary. Sing, listen, dance, recline or meditate to the chants. Who: Anyone who is interested in the practice of mantra or sound as spiritual practice. Great introduction for those who are new and heart swelling for those already practicing. Please forward and invite anyone who might be interested in this very special one-time showing! 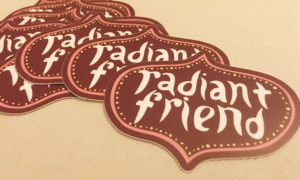 Come out to one of our upcoming performances and get yourself some sweet Radiant Friend stickers! 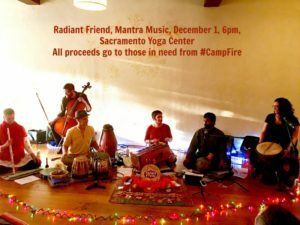 Radiant Friend is a multi-instrumental Kirtan band in the Sacramento area, led by Alicia Patrice. Our hope is to introduce as many people as possible to the heart practice of chanting through Kirtan and the Dances of Universal Peace.